It’s been an interesting twelve months for all the water-coolers out there. We’ve had the launch of the D-tek Fusion V2, Swiftech Apogee GTZ, OCZ Hydroflow and XSPC Delta V3 CPU waterblocks and we’ve seen plenty of new GPU blocks too. Blocks for both the Nvidia GeForce GTX 200 series and ATI Radeon HD 4800 series graphics cards have been launched as well as some interesting dual GPU blocks for the HD 4870X2 and the GTX295. 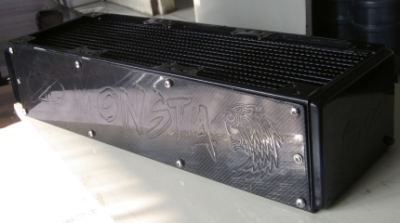 However, it’s in the field of radiator design that things have been most interesting with no less than three different approaches aimed at improving cooling performance from three manufacturers. 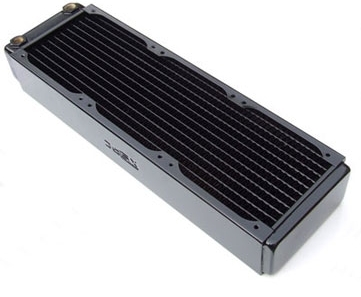 Each has caused quite a stir in the water-cooling community because of the way they differ significantly from previous designs. 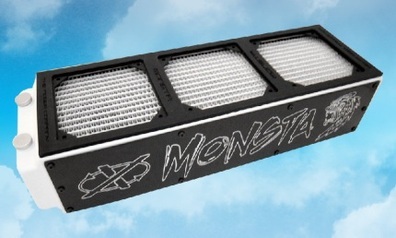 The first to rock the boat was Feser’s Monsta radiator. The clue’s in the name, albeit a slightly misspelt version of the word depicting anything from excessive to something big, hairy and ferocious. In fact if you cross the hair out of the equation this pretty much sums up Feser’s monstrosity of a radiator. The main issue here clearly is its size and it's lucky the Monsta is on a limited production run else it's 476 mm (L) x 148.6 mm (W) x 104.2 mm (H) dimensions would render it difficult to use in all but a handful of very large cases. Again the biggest issue here is size. Bear in mind the radiator on the right is a PA120.3 which is no small radiator itself - you can see just how big and wide it is. Eagle eyed readers will also notice that it's also too large for 120mm fans - that's right you'll need to upgrade your fans too! 140mm is now the name of the game, or is it? Maybe this is the way standard case fans are heading? (Let us know your thoughts on that one...) It undoubtedly performs brilliantly but most of us will struggle to find room for it. So what with radiators that are too deep or too wide, it's sounding a bit like goldilocks trying out the bear's porridge doesn't it? Well luckily someone has the sense to design a better 120mm type radiator that might actually be of some use to us mere mortals with limited space under our desks and cases that cost less than £200. XSPC's new RX range of radiators conform to the usual 120mm design with 15mm fan spacing but are a similar shape and size to most other 120mm type radiators (Thermochill 120.x, Feser Xchanger etc). What's more, they feature an incredibly low FPI of just eight. 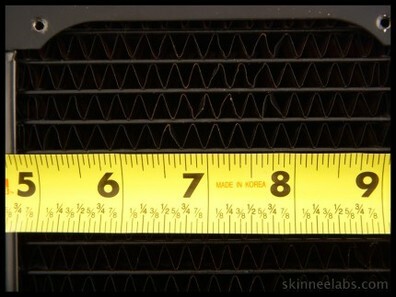 FPI, for those not in the know, is how many folds/fins there are in the copper strips that are bent into place between the small tubes in the radiator and act to increase the surface area in contact with the air. A low FPI means less resistance your fans will have when drawing air through the fins allowing you to use lower RPM fans for less noise. A high FPI will have a greater surface area but will mean you need to use some noisier beefier fans to use its full potential. 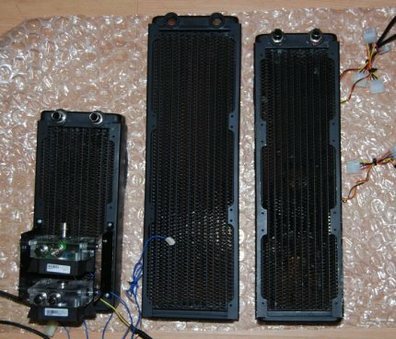 Previous XSPC radiators and the Thermochill PA120.x series use 13 FPI and early tests show that the RX series can edge out the PA120.3 when using identical fans up to medium RPM.